This cleaning brushes accessory and attachment contained mattress tool brush, wide nozzle brush tool, 2 in 1 crevice dust brush tool, stiff bristle brush tool, soft dusting brush tool and connector adapter. Each tool has different function. Mattress Tool Brush: Main cleaning mattress, cloth sofas, pillows, clothing, car seats, curtain, bed, quilt and other fabric products. Wide Nozzle Brush Tool:Mainly clean the ground, all types of surface stubborn stains and water stains and so on. 2 in 1 Crevice Dust Brush Tool: 2 in 1 Combination brush can be used to clean cabinets, refrigerators, sofas, bed, car corners and other narrow gap space. Stiff Bristle Brush Tool: 2 in 1 nozzle, unique lifting PP bristles, to the edge of the suction side brush effect, can clean the big brush that can not touch the place. Such as bed, sofa cracks, windows track. Soft Dusting Brush Tool: Soft and light brush can clean the dust of the surface. Perfect for dusting shelves, lighting, delicate surfaces, electronics, and more. Connector Adapter: Fit tool adapter converter, can increase the tools length, more convenience and save your time. This attachment kit compatible with Dyson Vacuum V6 DC33 DC35 DC44 DC58 DC59 DC62 models. Replacement attachment parts for Dyson Vacuum, NOT original. Fit Modern: 6Pcs/Set replacement Dyson Vacuum Cleaner Attachment Kits suit for Dyson Animal DC59, V6, DC33, DC44, DC35, DC24, DC16, DC62, DC39. 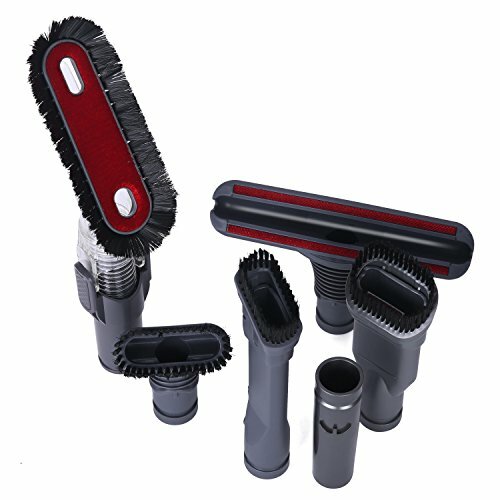 High Quality: ABS + PP plastic material, each Dyson Tool brush and attachment contained within this set has been specifically designed to suit a unique home-cleaning challenge, as well as being manufactured to the high standard of quality. Wide Range Of Applications: 5pcs cleaning tools brush kit meet all kinds of cleaning needs, such as mattress tool brush main cleaning mattress, cloth sofas, pillows, clothing, car seats, curtain, bed, quilt and other fabric products. Soft dusting brush tool can clean the dust of the surface. Perfect for dusting shelves, lighting, delicate surfaces, electronics, and more. Practical and Durable: Can be repeatedly used, just use the water to clean, very simple and durable. It will be cleaned where you want, let your home become more comfortable and clean. Package Content: 1x mattress tool brush, 1x wide nozzle brush tool, 1x 2 in 1 crevice dust brush tool, 1x stiff bristle brush tool, 1x soft dusting brush tool, 1x connector adapter. If you have any questions about this product by Yesurprise, contact us by completing and submitting the form below. If you are looking for a specif part number, please include it with your message.